Once again, the Mingei movement was extremely influential in so many fields as well as in ceramic. Yanagi Souetsu was a philosopher who stressed the value of traditional Japanese crafts quite a bit. Hamada Shoji and Kanjirou Kawai followed along, become the other two amongst the first three masters of this elegantly simple style. Naturally this would cause the appearance that ceramics were always clearly pushed in the school. To some degree this is certainly true, though wood and lacquer work was also always important along with metal as well as textile. Munakataet Shikou, for instance, was a great engraver who worked in the style. Serizawa Keisuke, who is known for making paintings on fabric, also joined the movement over time. Various other more eclectic crafts eventually started to join up as well. This makes sense, considering that this was intended all along to be a popular movement. It wasn’t supposed to be one that merely adhered to specific academic constructs. 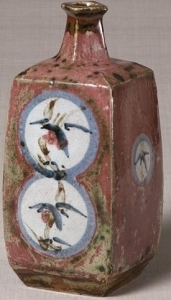 Kawai Kanjiro used a shinsha glaze on this square vase from the Japan Folk Crafts Museum. Mingei art was even known to inspire Noguchi Isamu and Charlotte Perriand, among many other eclectic personalities. Potters always remained high profile in the field, though. Not all of these were even exclusively Japanese. International interests had started to follow along with this particular style. Eventually Bernard Leach, who was an English potter, actually ended up in the Mingei style. What appeals to people about it must truly be universal. As it stresses traditional thinking with a very natural twist, it can be seen as a panacea for the sorts of things that bother us in the modern era. Moreover, the entire idea of it not fitting into rigid boxes was attractive to a lot of people who felt that art had become stuffy. No one had to feel like they were simply attached to a certain set of rules, which can feel quite liberating to those with academic backgrounds. 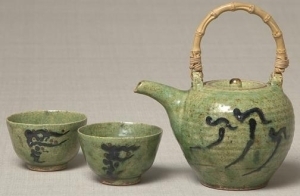 Raku ware by Bernard Leach, photo credit the Japan Folk Crafts Museum. Over time more and more interest was applied to the style. The Mingei International Museum opened up in California in the United States as early as 1974, at a time when many of these styles were still unknown among Western academics. The building even first opened to the public in 1978. This could be looked at as the ultimate culmination of Yanagi-sensei’s work. The term Mingei, after all, is a combination of the Japanese words for art and all peoples. He would certainly have appreciated the fact that ceramic yakimono pieces could be enjoyed the world over.